Are there alien structures in the Kepler Mist? Jim Hoover in Science & Technology on 25 October, 2016. 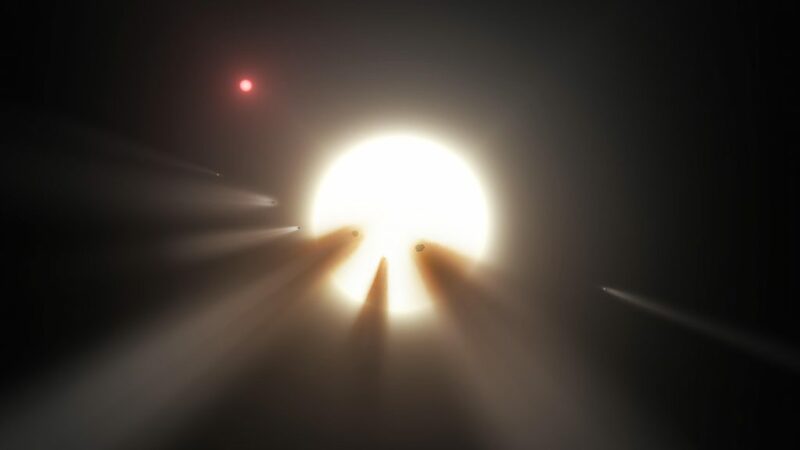 An artist’s impression of a swarm of comets moving across Tabby’s Star. KIC 8462852, popularly called Tabby’s Star (named for Yale astronomer, Tabby Boyajian) or WTF Star, is a main sequence F3V star and has been studied by the Kepler telescope, a telescope dedicated to detecting exoplanets in a designated region of space. What is peculiar about Tabby’s Star, which is some 1500 light years away (9,000 trillion miles), is the star’s unusual series of brief – alternatively prolonged — dimming events recorded by Kepler’s sensitive instruments, when some object or objects pass in orbit between Kepler’s telescopic lens and the star. Kepler observations of its luminosity not only show small, frequent, non-periodic dips in brightness, but also two large recorded dips roughly 750 days apart. Of the latter dips, the first occurred on 5 March 2011, obscuring the star’s brightness by some 15%, the second on 28 February 2013, dimming up to 22%. Unfortunately, the failure of Kepler’s reaction wheels did not allow Kepler to record the next expected dimming around April 2015. But the dimming seems so irregular that expensive 24/7 monitoring is required. Another consideration is that a star hotter (6750°K) than our own G2V Sun (5800°K) with alien intervention would have a viable Goldilocks planet (one inhabited by beings who built and maintain the proposed megastructure) transiting KIC 8462852 perhaps precisely every 450 days with less than a 1% luminosity reduction. Kepler readings are unable to indicate this. The WTF Star is a mature, intrinsic variable star. Kepler’s recorded loss in luminosity for such a star is not deemed possible. In addition, high-resolution spectroscopy and imaging observations have not uncovered debris fields around Tabby’s Star to explain the dimming, though it is actually something you might see around a much younger star or a protostar. With all of these unanswered questions about Tabby’s Star, most astrophysicists are careful about alien-related speculations until more observations are in, including a Kepler look at the expected 750-day dip in May of 2017. However, media interest went viral a year ago when a group of astronomers from Pennsylvania State University released a publication that cited KIC 8462852’s “bizarre light curve” as “consistent with” a swarm of alien-constructed megastructures. This prompted SETI (Search for Extraterrestrial Intelligence) Institute scientists to focus its Allen Telescope Array (an array of 42 radio antennas) on the star to look for radio signals indicating the presence of an alien civilization. Last November, they said there was no evidence of such a civilization. Now the four-year Kepler study of KIC 8462852 has credibility in terms of more rigid standards of observation, in addition to a regimen and a technology which utilizes a more advanced knowledge of stars. In contrast a LSU study published in the Astrophysical Journal in January saying that Tabby’s star had dimmed by 20 percent over the last century has been recently debunked by a Vanderbilt doctoral student in the same Journal. He rightly observed that the 20% dimming was speculative, being based on 500,000 photographic glass plates taken by Harvard astronomers over more than a hundred years from 1885 to 1993, this with widely varying telescope and photograph technologies . But the four year Kepler study of Tabby’s star is solid by all scientific accounts, though often the conclusions are not. Though one of the latest accounts tends to center more on the mysterious aspects, there is peculiar evidence that could offer alien-fabricated megastructures as one of the options. However, serious scientific study requires careful identification of all of the options, keeping in mind that other worlds may have outliers not seen in our own solar system. For example, even the greatest scientific thinkers seem to be captivated by popular fiction’s treatment of aliens and alien mysteries. Grasping, warlike aliens, bent on invasion, characteristics seemingly built out of man’s image, are assumed to be the rule with alien encounters. In the same way, getting notice on internet platforms regarding space seems to involve mysteries morphing into alien presence, too many times without regard to hard evidence or reason. All seem to be embellished, built on our level of technology borrowing the exigencies of our corporate media. We seem to forget the variables or to impute the limits of our own science and our accompanying weaknesses to others who may be much farther advanced, indeed, so far advanced that they may have the means to travel great distance, thus mastering a technology that has no need for our resources. Therefore, there are a number of things we need to consider. First our images of Tabby’s star originated some 1500 years ago. Thus what is transpiring happened then, not now. Any SETI evaluation of the existence of life also must consider that any radio waves from KIC 8462852 originated 1500 years ago, and that we probably can’t assume that alien communication is of the radio wave variety. The latter assumption would most likely be primitive communication for a technology with the ability to assemble mega structures 1500 years ago. Using our still primitive technology to observe happenings occurring some 1500 years ago, parsing an astrophysical understanding built on a still-limited perception of our own solar system, and being badgered by a media eager to sensationalize any observational peculiarities, we best wait for facts and evidence to grace our speculations. We can recognize that the reductions in luminosity of Tabby’s star are unusual, even peculiar, luminosity declines that seem to indicate a swarm of objects passing in front of it. Astronomers have noted that the passage of a Jupiter-sized planet in front of Tabby’s Star would only cause a reduction of 1%, not a whopping 20%. In fact, Tabby Boyajian, the Yale astronomer who first studied the KIC 8462852 data, said the deepest dips would take an object 1,000 times the area of the Earth transiting the star to produce such a dramatic effect. From here, the steps we take should be measured and informed. Scientists should not be eager to grab attention in the media, but only eager to advance our knowledge and satisfy a spirited curiosity. Mouse clicks, likes, and comments are the measurement tools for website posting popularity but often fail to advance the scientific method, or learning.